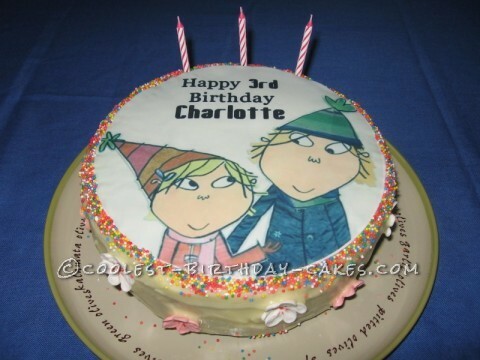 This Charlie and Lola cake was SUPER simple and so well loved by my little Charlie and Lola fan! I had the image on the top made by a company who specializes in this, they have images you can choose from. They can be fiddly to apply, but the result is pretty cool. It’s a shame it was a little rippled by the not-so-flat icing underneath. Top Tip: Use an icing color underneath the edible image (so it sticks) that is the same color as the image. I used white (ivory) cream cheese icing for this so it wouldn’t show through. I made a Madeira cake and it had a layer of the cream cheese filling inside too. I sprinkled around ‘Hundreds and Thousands’ (or ‘nonpareils’ in some countries). It stuck to the icing nicely, but make sure you do this before the icing sets or they don’t stay put. I bought the flowers in a packet at the grocery store. Cream cheese icing is OK out of the fridge for a few days due to the sugar content, bakeries do this all the time, their icing stays out in huge buckets! It was yum! My daughter exclaimed “Gasp mummy! You’re cutting through Charlie’s head” when it came time to share it out!